My visit to manglajodi on 21st. Jan.’17. Beautiful place for bird watchers with its own character of endless beauty of chilka lagoon with lakhs of birds. No trace of trees inside. Only wetland and meadows .Birds can be sighted from any angle and direction. As I did a little bird study before going to Mangala Jodi, I could identify some of the birds which I noted down in my pad. Name and identification of birds with its individual beauty within the bird world at mngld gives an another enjoyment in mind. The first view on the main road after a right turn from the village enchanted me and made me spellbound. What I read from previous visitor’s experience, that there are 200 species of birds. But I only tried to see those 25 type of birds which I recorded in my notepad. To my satisfaction, I found out 23 types of birds with its names. Some Tips for the visitors may be helpful. To Reach at Mngld. : I got down at Khurda Road station. From there I caught Local DMU (Berhampur Local) and dropped down at nearest railway station Mukteswar. From Mukteswar Rly. Stn. , Manglajodi Ecotourism cottage( manglajodi ecotourism website) is found visible and it is only 2 minutes walking distance. Also, one Private accommodation of local person Madhu Behra is there. It is almost 1 km. away from Rly. station. Another Third accommodation of Godwit ecotourism cottage, private(Odisha ecotourism website) is there.It is around 2 km.. Journey and everything is included in their tariff of booking. One can also take a direct cab from Khurda road to reach Mngld. Preferable stay: All the three accommodations have their own standard and facility. Godwit and manglajodi ecotourism are almost in the same standard providing the good facility. But the third one, the accommodation of local influential person, Madhu Behra is quite substandard.This is cheaper but the quality of food and the dirty room is far below the normal standard and there is a hell and heaven difference. Manglajodi ecotourism centre is preferable with respect to the budget and facility. It is associated with the Odisha Govt. Ecotourism Dept. So it can be preferred. Also, one more facility is that both the Mngldi eco.centre and godwitt eco.centre can be booked online. The third, Madhu Behra is not reliable.No system of advance booking is there. Only information through phone call but uncertainty to get it after reaching there at the spot. Boating: The most enjoyable event of mngld is boating inside the wetland. You have to reach jetty to ride on the boat which is 3 km. away from Mangld. Eco.T. Centre and the village. It is an isolated place.No locality or nearby hotel is there. I went there by walking and encourage everyone to go there by walking to feel and experience the beautiful road journey onto the jetty. Actually, it is not a road.It is a little dam to isolate the Chilka water land from surrounding wetland. Sighting of birds will begin after a walking distance of 1 km. only. Take photos and walk in the early morning or anytime in the winter. You will find two jetties operating there. One operated by Mahabir Pakshi sanrakshan Samity(a unit of ecotourism society) and the another is operated by Madhu Behra. Mahabir takes Rs.850/-per boat @ 4 persons and Madhu’s private rate is Rs.800/- @ 4 persons. Though Mahabir takes 50 rupees more but it is preferable because their all boats are shaded and will take you exact 3 hrs.trip as per the schedule. But Madhu’s boat is not shaded and trip time varies around 2 hrs.Preferable to take two trips, one in the early morning sunrise ( Boating starts at 6:30 AM) and another is just 3 hrs. before sunset. Snow Leopards are natives to the cold climatic regions where human population is very scarce. They live in harsh conditions on earth. Their white-grey coat perfectly blends in with the snow-clapped mountains of Asia and protects them from the adverse climatic change. Basically these wild cats are from carnivorous family and breed on sheep, ibex, hares, and marmots. They’re usually found at high, rugged mountain landscapes at heights of over 3,500 meters. With the increasing number of days, months, and years, the numbers of snow leopards is diminishing and very soon they will soon become extinct. If proper measures are not taken to save snow leopards by the responsible citizens of the countries and government authorities, very soon our ecosystem will experience a shift that will cause discord. According to a recent study, there are only 7,500–4,500 snow leopards left and they are too under attack for various reasons. These snow leopards are found high in the mountains of the Himalayas and in Central Asia. They are sporadically distributed across the globe in countries such as Central Asia, China, Mongolia, Afghanistan, Pakistan, India, and Nepal. Saving snow leopards is the need of the hour. These snow leopards are everyday under attack and their number is depleting rampantly for various reasons. One of the major concerns for their loss is climatic conditions. With global warming scenario all over the world, it will first affect the high snow and mountainous regions. Unfortunately, these places happen to be the habitat of these snow leopards. If their habitat is destroyed or changed, they move towards other nearby areas for survival. Again, these nearby areas are densely populated with humans. Humans feel a threat with the snow leopards and start attacking them. The human-animal conflict is the second important issue that needs to be tackled. The snow leopard preys on mountain sheep and goats. With less or no snow leopards, these herbivores will feed on all the grasslands and vegetation, thereby leaving no food for other wildlife. The same landscape makes available food and other important resources for the inhabitants; including medicine, heat, wood for shelter, and fuel. So by saving the snow leopard, we’re benefiting the whole natural ecosystem in these areas and the people who rely on them. Third and the saddest reason behind the decreasing number of snow leopards is poaching or illegal wildlife trade. As their natural prey becomes difficult to find, snow leopards are forced to kill livestock such as horses, sheep, goats, and calves for survival. The farmers in turn hunt these snow leopards and put them down. Saving snow leopard and its natural habitat is critical in protecting the environment and the ecosystem as a whole. There are many wildlife conservation groups that are working with local communities to monitor snow leopards and reduce their killing. There are reports of the government bodies working in close connection with Kanchenjunga conservation area in Nepal and their inhabitants to protect the snow leopards and reduce the conflict between the animal and the local residents. includes Innova Tavera Etios Dezire Tempo Traveller in their fleet. You can easily book a taxi in udaipur by call us at 8385859995. A Green Bee-Eater bird stuck in the web of a Giant Wood Spider. 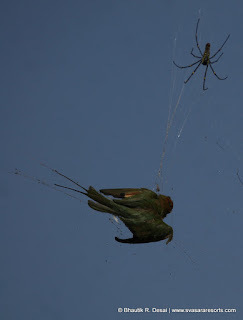 Story: How can a small species be defensive....here as everyone can see a bee eating bird is trapped in the web of a giant wood spider.... bee eater is a bird which feed on insects so the predator is a prey struggling for life. Mother nature always surprises you; it is never predictable ..! Every day is a new lesson for every animal in the wild....and this is how they learn..never ignore common species they are the base for us to learn and understand wild nature. Birds often feed on spiders to gain protein and use web material to line their nests. However, "birds in these situations are likely to be aware of the web and do not become entangled. In most cases, spiders do not dine on small birds caught in their webs and may even cut the web to drop the load a web-encased bird imposes on their intricate, gossamer-threaded insect traps. Also, a bird is normally too big a morsel for the mouth parts of a spider. Angelica archangelica, commonly known as garden angelica, Holy Ghost, wild celery, and Norwegian angelica, is a biennial plant from the Apiaceae family, a subspecies of which is cultivated for its sweetly scented edible stems and roots. It is the second most expensive nut and needs cold and hilly terrain with a few days of sub-zero temperature. Therefore, Himachal Pradesh and Jammu and Kashmir make the best choice in India. It takes three to five years for hazelnut plants to grow and yield fruit. We are pleased to introduce Panaramic150 Camera Trap Moultrie's Panoramic 150covers three times the area of a traditional game camera - perfect for a fieldor open woods. The Panoramic 150 is a specialtyMoultrie game camera for capturing high quality, super-wide digital images ofdeer and other wild game on your land or hunting camp. With an incredible150-degree field of view, Moultrie Panoramic cameras cover more than 3 timesthe area of most traditional game cameras – giving that elusive trophy buckvirtually nowhere to hide. With rugged construction that stands up to theelements, and stealthy design that make it virtually invisible to game, thePanoramic 150 doesn’t just work hard; it works smart. It’s a big world outthere, so make sure you’ve got a game camera that can capture it: the MoultriePanoramic 150. Ideal for open woods or fields, thePanoramic 150’s super-wide field of view lets you see so much more of the worldaround it. The 150-degree field of view is almost 3 times more than most gamecameras, so you get a more comprehensive picture of your territory. Decked out in Mossy Oak® Treestandcamouflage and powered by Moultrie’s advanced 100-foot Low-Glow infrared flashtechnology, the Panoramic 150 is designed to capture images of nearby gamewithout disturbing them. Day or night, the motion sensors detect prey within 45feet – and the lens silently rotates to capture the panoramic photos or HDvideos. The Panoramic 150 employs a passiveinfrared (PIR) motion sensor that’s triggered by heat and movement within 45feet. Delay is a low-power "sleep"state entered after image capture. Longer delays extend battery life and limitthe images recorded in high-traffic situations (e.g. – on a very busy gamefeeder). The camera can be set for 5, 10, or 30 second delays as well as 1, 5,10, 30, or 60 minute delays. When using the Motion Detect function,multi-shot mode allows the camera to record multiple photos per trigger. ThePanoramic 150 can be set to take 2 or 3 photos in succession after motion isdetected. Still photos are taken when an animal isdetected. When any of the sensors detect an animal, the camera will take aseries of three photos, one at each position (right, center, left) and combinethese into one panoramic photo. Still photos are taken when an animal isdetected. The number of photos taken when an animal is detected is configurablein Settings. The position in which the photo is taken (right, center, or left)depends on which sensor detects an animal. Timelapse mode disables the PIR sensorand instead triggers the camera through a countdown timer that will activateduring sunrise and sunset, and is adjustable from 1-4 hours. The camera can be triggered by both itspassive infrared (PIR) motion sensor and a time-lapse program. The Panoramic 150 resets rapidly afterimage capture, taking only 1 second after a motion trigger until the camera isfully ready to detect motion and capture more. The flash is equipped with 30 LightEmitting Diode (LED) lights. This 850nm Low-Glow LED technology is minimallyintrusive and can illuminate game up to 100 feet away in total darkness. For night-time operation of the camera,you can select between reduced motion blur or extended flash range to maximizeimage clarity and visibility. Features a 150-degree diagonal viewingarea recorded by the camera. Camera requires 6 C-cell Alkalinebatteries that should last up to the capture of 9,000 images. This is aconservative estimate of photos that can be taken before the camera’s batteriesare depleted. Actual results vary based on user settings and environmentalfactors.